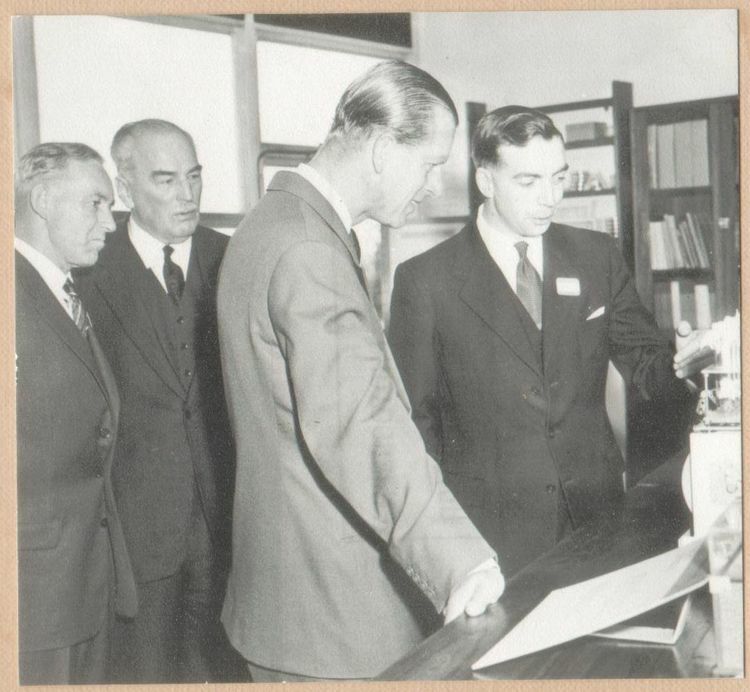 Les Fitzgerald (definitely), Bob Maude (definitely) and John Bray. 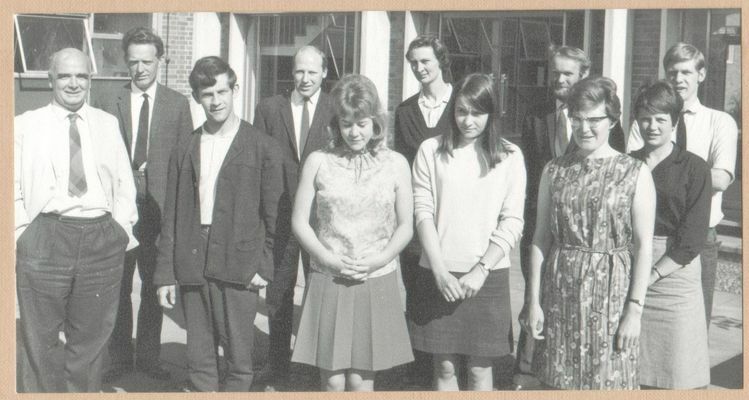 L to R: Denley Wright, Jan Cotton, Mrs Wright, James Philp and Mrs Philp. prior to demolition of one and letting out as a business unit of the other. The finder, Willie Turnbull, spotted some pictures of his brother Ken and Ken now has the original album. 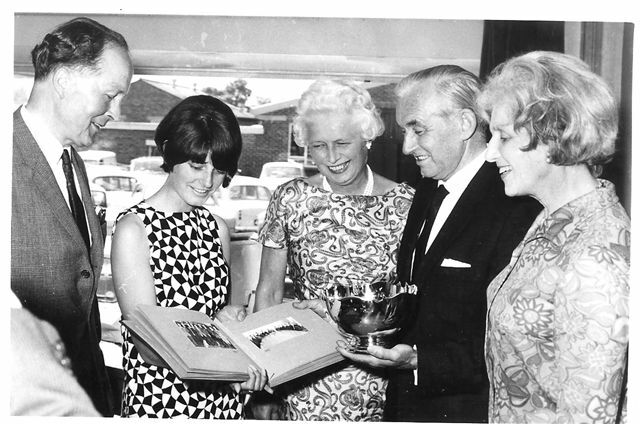 It is a copy of an album presented to Dr James Philp, the first director, on his retirement in 1967.
which I believe had been taken away previously and it would be great if they turned up. 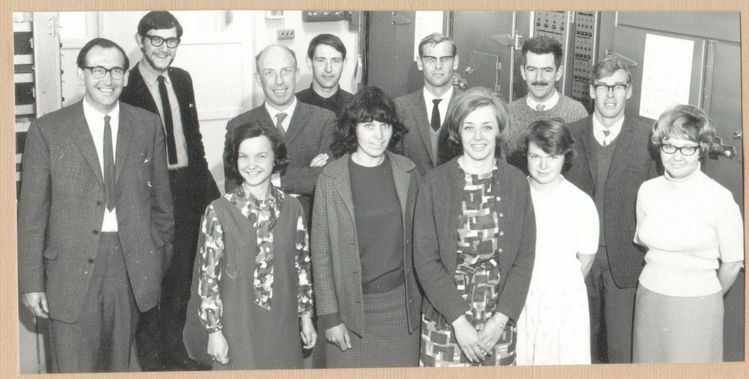 and more information has been gleaned from a set of annual reports which another colleague salvaged. It looks like his brand of pipe tobacco wasn't popular. Richard H says ?Geoff Wheatley? along with those of subsequent directors until 2004. 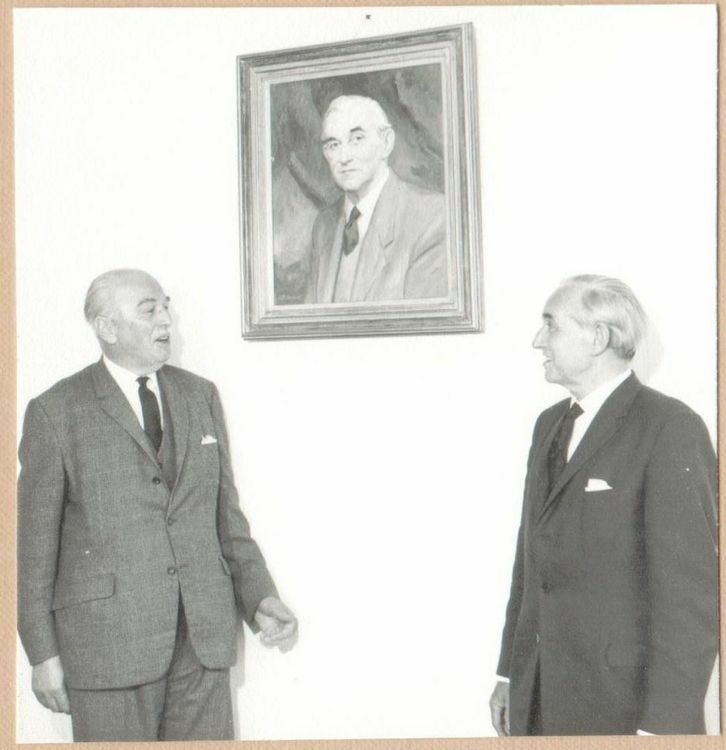 When the university took over all the portraits were taken down and disappeared. 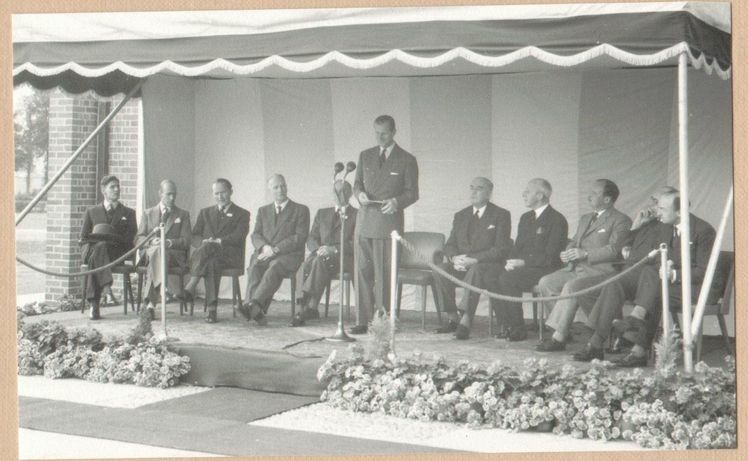 There were twenty three members of the governing body at the time but only a dozen present here. Apart from Sir David Lowe the chairman I'm not going to try and identify any of them. This was part of a phase of building started in the summer of 1953. The light levels suggest this photos was taken in the winter of 1953/4. 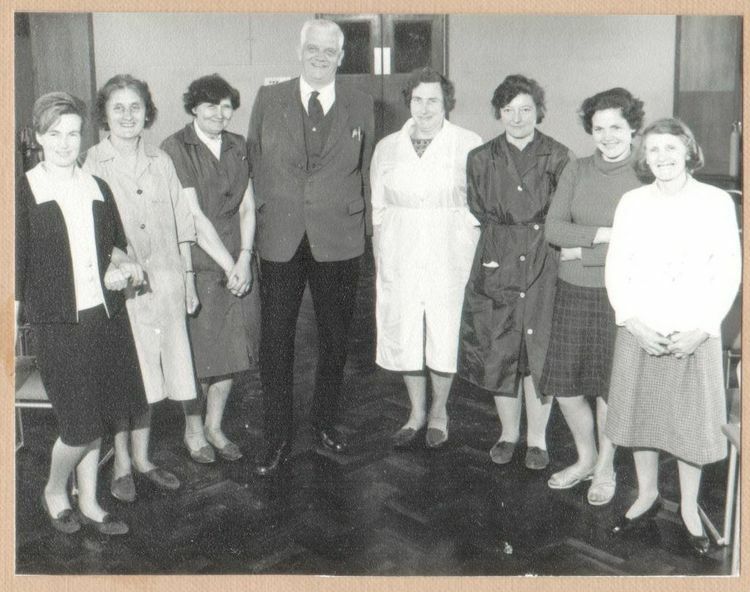 or MJ Webb who was Head of Vegetable Washing). 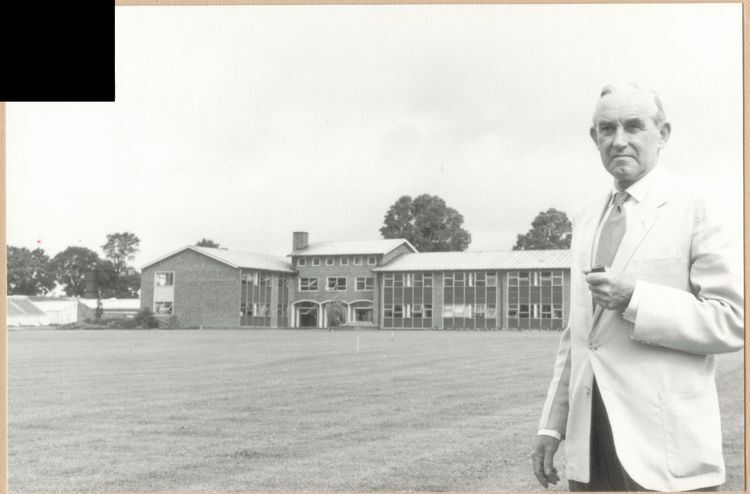 **This photo is labelled 1967 but Dr Haigh retired September 1966. 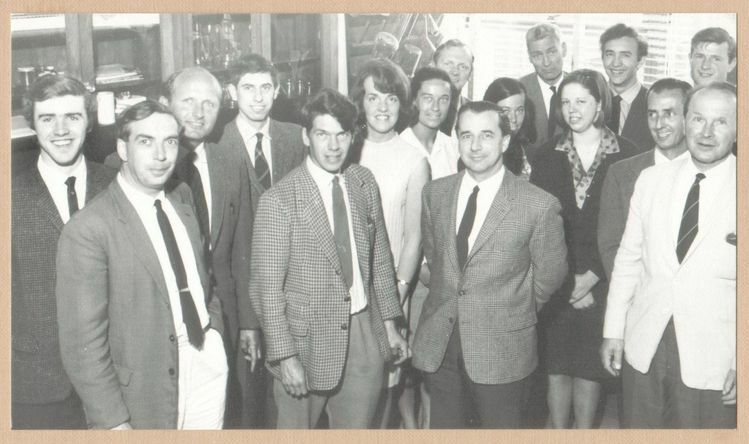 Incidentally Ken is sure that Dr Keyworth was director for a while between James Philp and Denley Wright. The reports disagree. Could he have been Acting Director at any time? 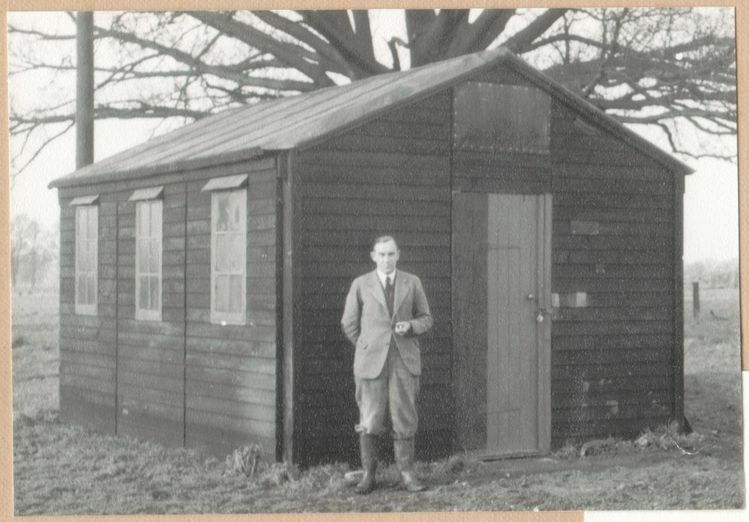 This photo was taken earlier than 1967 since building work listed in the station report for that year isn't visible and the hut is still on the green. Most of the trees seen in the hedgerows here were elms and were lost to Dutch Elm Disease in the 1970s. is actually the cricket pitch. 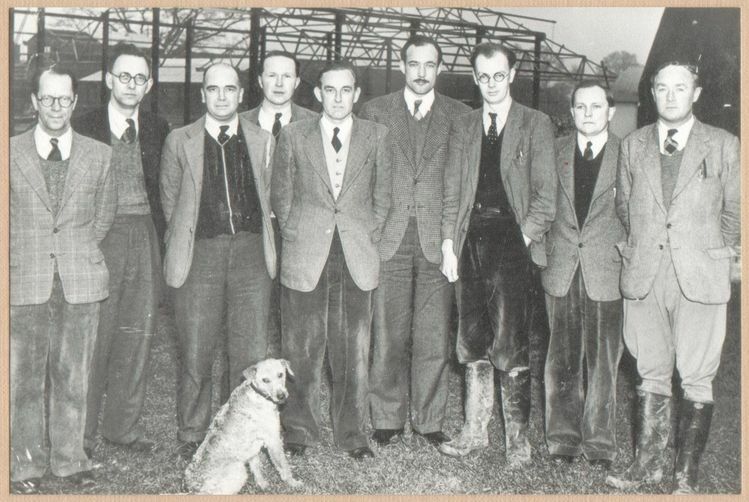 The building of the Insect Rearing Unit on the lawn next to CE began in 1967. In the enclosed farm yard the walls of pigsties can be made out but not the wall used to segregate the cattle that divided the yard. These walls have all now been demolished but the cattle stalls are still in there and the stores are still referred to as 'the piggeries'. I am told enough bricks for all the houses were bought in advance and stacked on site and then the houses built when the budget allowed. mostly acquired from the Charlecote estate in 1949. For some reason the fields nearest the village were not acquired until 1959. (Beanham farmhouse is now the Charlecote Pheasant Hotel). 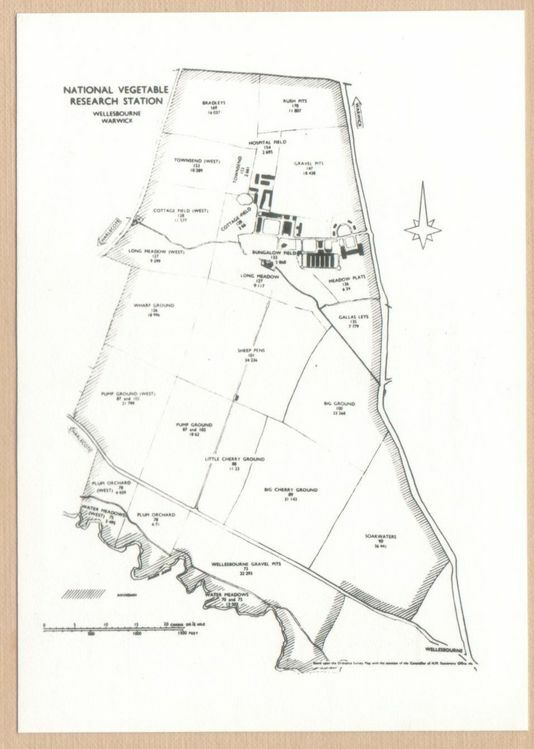 All of the site was in Charlecote and none in Wellesbourne but evidently it was considered better to associate the station with the larger settlement. (Now HRI's conference facilities are advertised as being in Stratford-upon-Avon). The map shows the former line of the A429 before it was straightened to bypass Wellesbourne and became a race track. 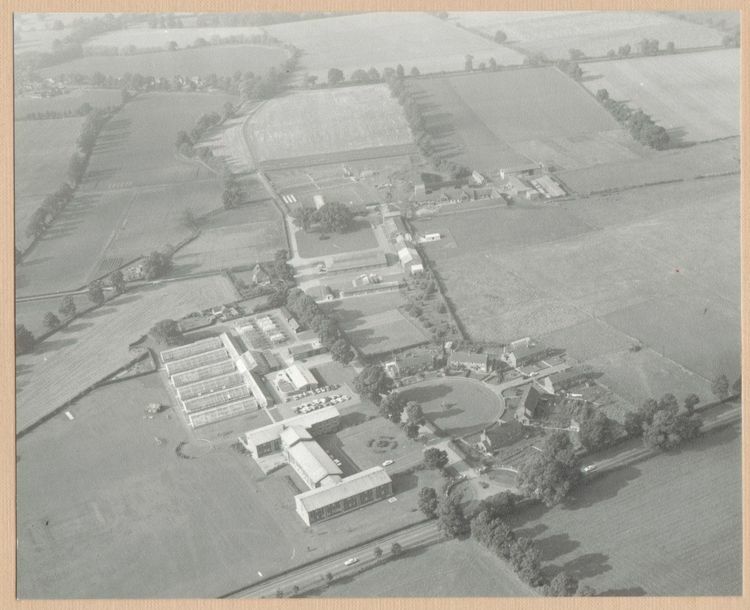 This lost us half of Soakwaters field on which the houses of Hammond Green and Charlecote Fields were built. 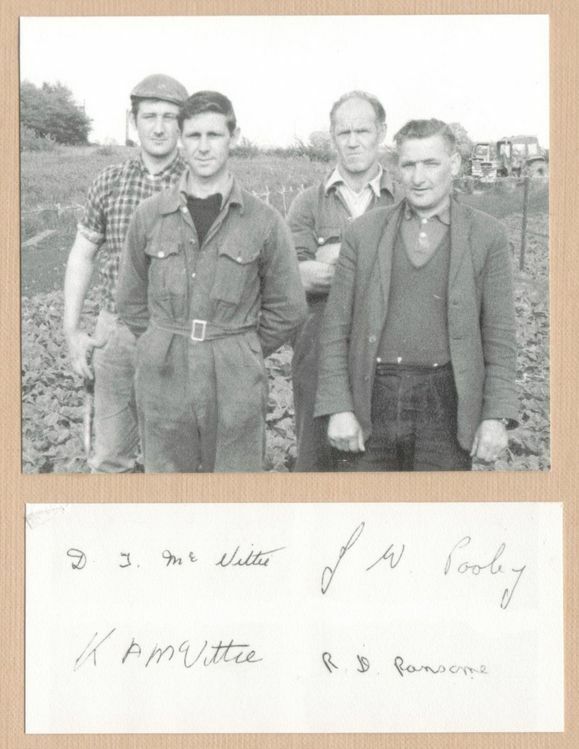 (I think this is when we acquired the field named Willoughby, after Neil Willoughby, the farm technician sent over to survey it, in exchange). I'm not sure if the very point of Soakwaters field where the petrol station. stands was ever part of the farm. The King's Head pub represents the end point of Charlecote land. 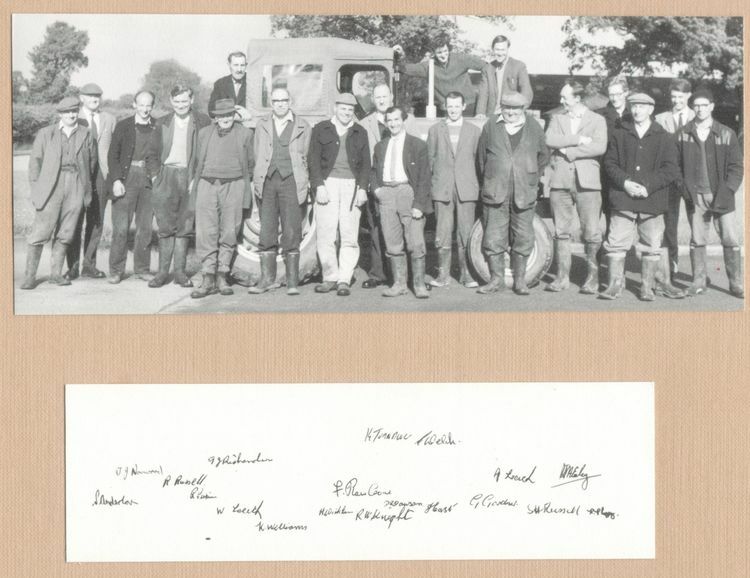 The number of farm staff at the time was partially due to the needs of the cattle and pigs kept on the station until the late 1970s to aid with soil fertility trials. There are now five staff under a farm manager looking after a larger farm (and absolutely no casual or summer workers). 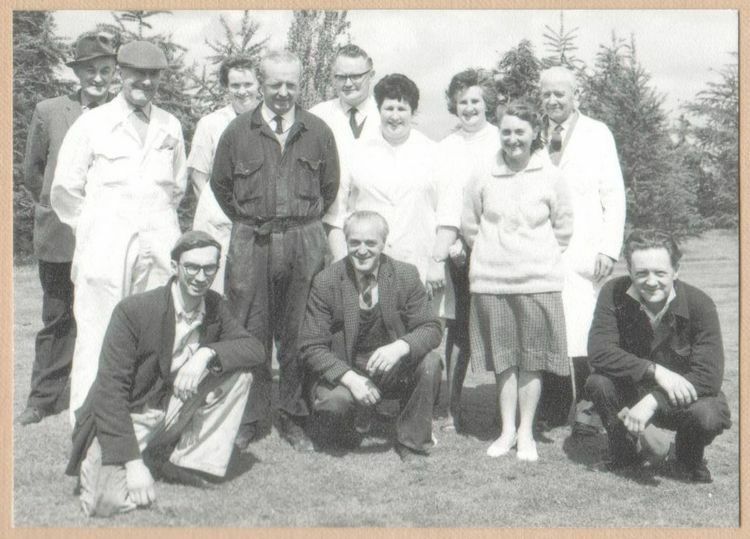 This changed frequently so only Mrs Knights (wife of Reg of the Farm Staff) 2nd from left ,and Archie Selwyn (father-in-law of Jan in Entomology) in the middle have been identified. 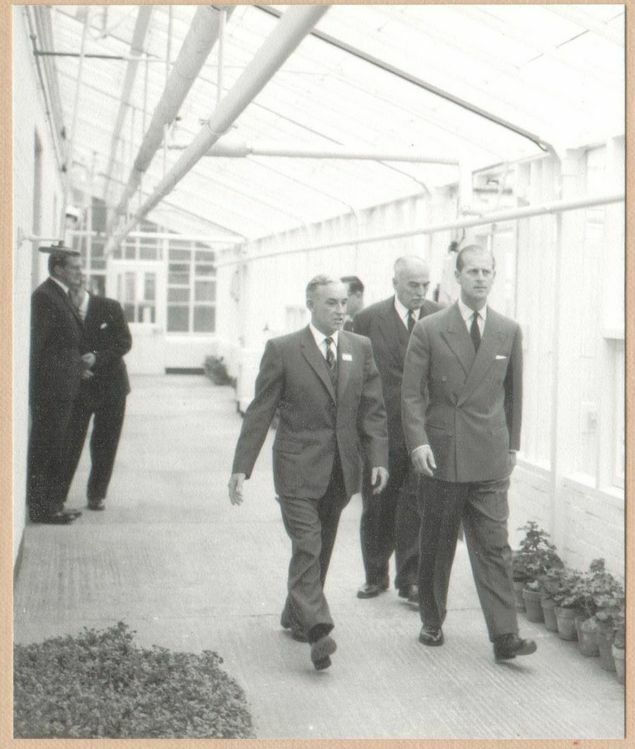 1967 saw the construction of Glasshouse 7, the first to have an automatic watering system! There are now a lot more glasshouses and poly tunnels looked after by eight staff under a Protected Crops Manager. The Bioconversion Unit (mushrooms and composting) has one technician with some assistance and the Gene Bank has its own technician. 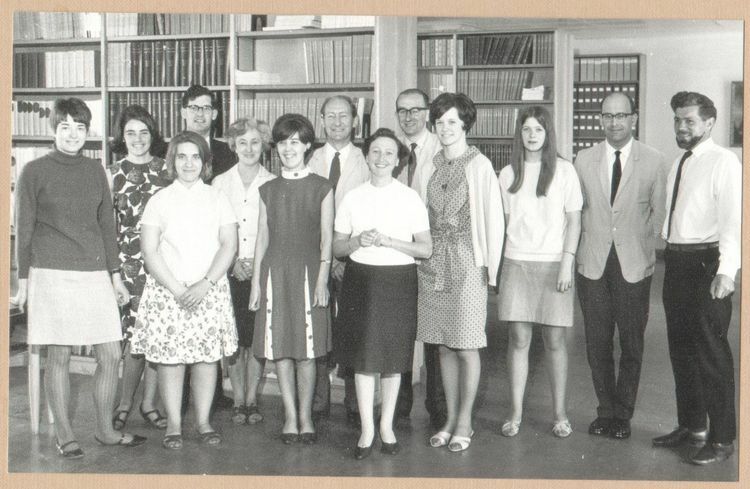 Jan Gerwitz (n?e Harris) (Library Assistant) (on right, long hair), Doug Bartlett (Accounts), EA (Ted) Hillman (photographer). (E A H is also noticeable in the photos of theatrical productions). 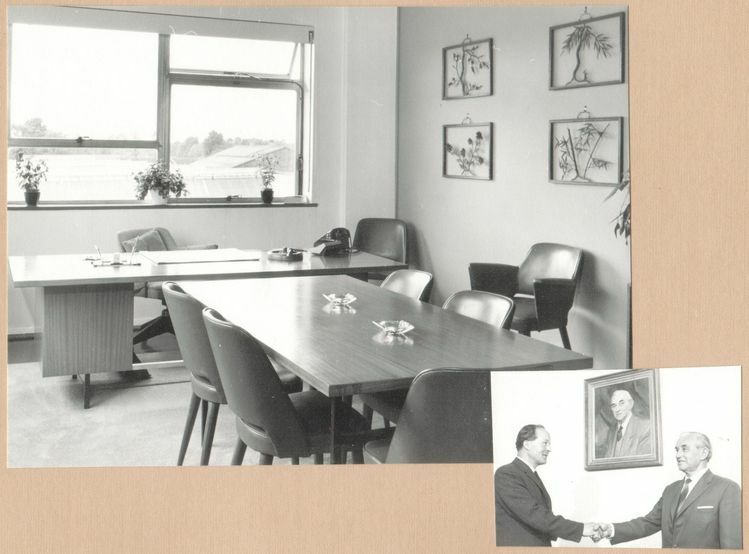 Meeting room (James Philps' office?) and James Philps and Denley Wright shaking hands in front of Dr Philps' portrait. 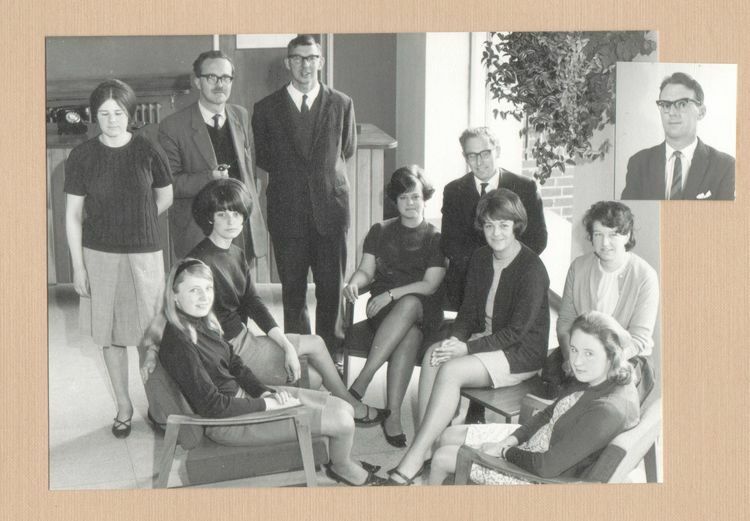 Front Row L to R: John Bleasdale, Miss Celia J Bruton, Sue P A Lyons , Sue Tandy, Rosemary Coombs, Miss JA Havard? 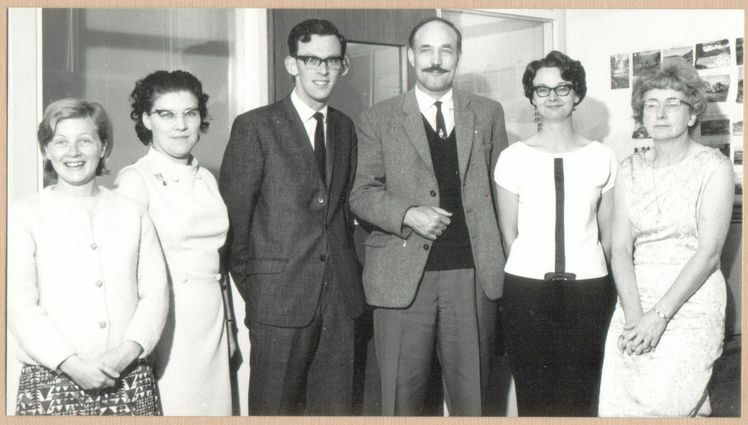 * Dr Freeman was head of the separate Biochemistry section but had no staff under him for most of 1967. G E Dixon was head of this department but it is disputed that the inset picture is him.